What makes the Lost Shaping team & the Catalyst standout from the competition? 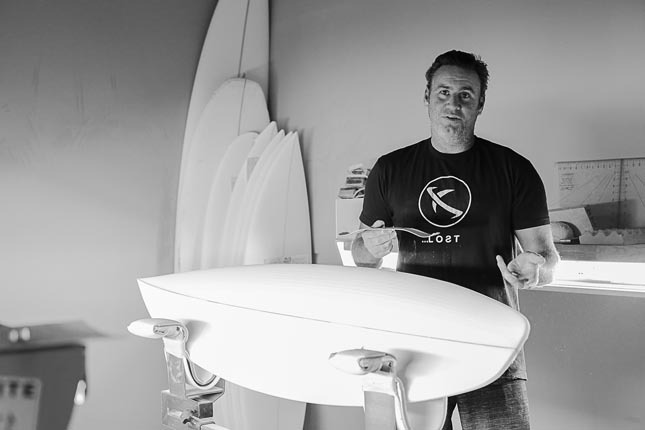 MB: AS THE FOUNDER/ CO-OWNER , I HAVE HANDS ON BUILT BOARDS EVERY DAY, AND TRAVELED EXTENSIVELY FOR ALMOST 30 YEARS. WE HAVE OF OF THE BEST TEST TRACKS IN THE WORLD ( TRESTLES ) AS OUR BACK YARD. WE AND OUR FOREFATHERS HAVE BEEN BUILDING BOARDS THERE , NONE STOP, SINCE THE EARLY 70s. MB: OUR TEAM OF CRAFTSMAN HAVE HUNDREDS OF COMBINED YEARS EXPERIENCE AND WE HAVE CONSISTENT ACCESS TO THE BEST SURFERS IN THE WORLD PASSING THROUGH OUR TOWN. Jason Biolos roughing out uncut blanks in the Lost shaping machine. What kind feedback do riders like Kolohe give to influence boards like the sub buggy? MB: THEY TELL YOU WHEN IT WORKS AND WHEN IT DOESN’T. What direction do you see hi performance board templates going in the future? MB: THAT IS DRIVEN BY THE DEMANDS OF THE BEST SURFERS. What was the best thing you saw at the Lowers comp this year? MB: STEPH GILMORE IN THE WOMEN’S FINAL. Matt started an Instagram Contest to Design the Sub Buggy Logo. Tattoo Artist @The_mfb nailed it. We hear you’re doing a Euro tour, what euro are you looking forward to most? MB: AS A SURFER, REALLY LOVE IT WHEN YOU FIND THOSE SPECIAL SAND BARS UP DEEP INTO HOSSEGOR….. THOSE ONES THAN FEEL AND SURF LIKE A SAND BOTTOM, BARRELING LOWERS. AS A FAMILY MAN/ GLUTTON/TOURIST, I ALWAYS LOVE THE FOOD IN SAN SEBASTION. THE PINXTO BARS AND BACK ALLY RESTAURANTS ARE THE BEST IN THE WORLD. Whos more territorial Trestles Locals, or Basque Dudes? THE BASQUE GUYS , AND THE GOOD SPOTS, ARE WAY MORE RADICAL. CALIFORNIA , OC IN PARTICULAR, HAS TOO MANY LAWS AND LAWYERS FOR ANYONE TO BITE LIKE THEY BARK. Last time you snapped on someone in the water? Haha. OH GEE, SOME GUY WHO COULD BARELY SURF, AT UPPERS, DURING THE HURLEY PRO. HE HAD A GO-PRO ON HIS BOARD AND ALMOST KILLED ME CUS HE WAS WORRIED MORE ABOUT HIS SELFIE THAN WHAT WAS IN FRONT OF HIM PADDLING OUT. A few of your favorite San Clemente destinations? NORTH BEACH NUTRITION, ACTIVE CULTURE, ELLIE’S TABLE, TAKAO, NICKS ( BOTH ) MC-GREAT RECORDS, BANZAII BOWLS AND SONNYS PIZZA.